The neoprene handle is perfect for slipping over the wrist or holding in the hand and distributes load for decreased "pinching"
The EzyDog Neo Collar has taken what has been the 'standard' in dog collars in the industry to a much more comfortable and functional level. 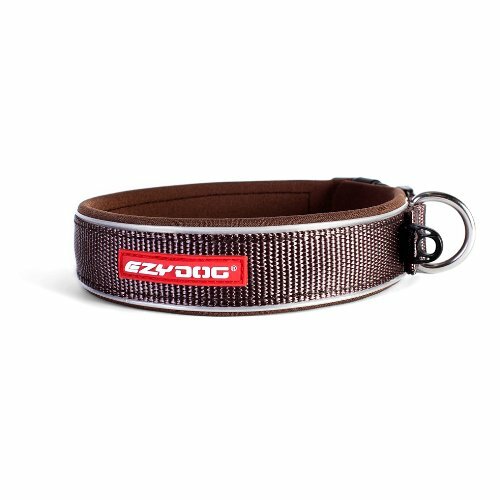 Waterproof, rust proof and nearly stink free with easy cleaning put the EzyDog Neo Collar ahead of the pack. EzyDog Neo Collars now include a gear clip for your dogs ID tags or other clipable items. Like our original they still offer the best in comfort, style and durability. Soft rubber neoprene (the same material used in wetsuits) is reinforced with nylon webbing for strength. Hook and loop adjustments make sizing a breeze and the quick release buckle offers strength with ezy-on and ezy-off convenience. Completely waterproof and easy to clean.